Resort Playa Montroig - Costa Dorada, Spain - Book online now! Playa Montroig Camping Resort, where the good things in life come together. A beautiful, immaculately landscaped park surrounded by trees, Playa Montroig is a luxury camping site bursting with activities and entertainment for the whole family. With a magnificent beach on your doorstep, come and discover the magic of the Costa Dorada. Please note that hoverboards are not allowed on this campsite. Some mobile homes are situated directly near the railway track. This can cause some noise due to their location. Why Playa Montroig Camping Resort? Surrounded by lush greenery, the 3 big lagoon pools and children’s pool with interactive games have been designed with the whole family in mind. Relax under a palm tree on one of the lagoon islands and watch the kids as they have the time of their lives on the water slides and chute. Swimmers have their own area to enjoy leisurely strokes across the pool. Ample terrace areas with loungers provide idyllic spots for enjoying the sunshine and a drink between dips. Children have 5 lavishly equipped play areas to roam and can take part in a variety of activities. This is an ideal opportunity to make new friends whilst learning a handicraft, playing on the beach, competing in a sports tournament or enjoying a live show. After a day at the beach or pool, teenagers can hang out at The Loft. Here they can shoot pool, play pinball and socialize. A well-equipped gym, 3 tennis courts, 2 football pitches, basketball court, beach volley ball and 10 table tennis tables mean the sportive are spoilt for choice. Now is also the ideal time to let your artistic side blossom – enjoy learning a traditional craft or discover a hitherto dormant artistic talent! 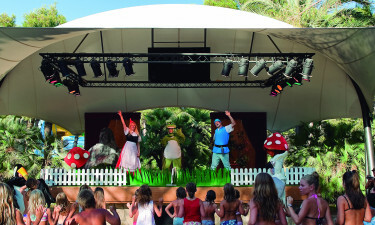 Adults and children alike can take in a show at the La Carpa open-air theatre, with daytime and evening performances. Hiring bicycles is the ideal way to explore the immediate area. There are numerous Blue Flag beaches to visit and water sports to enjoy. Treat the kids to a fun-filled day out at Port Aventura or Aquopolis and then embark on a cultural and culinary odyssey. From the picturesque port of Cambrils to the wonderful city of Barcelona, there is much to devour! 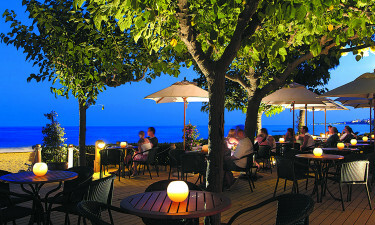 The Espai Grill Restaurant is the place to go for delicious grilled specialities. Discover the finest Mediterranean cuisine at the Terrassa Restaurant. Liquid refreshments are served at the coffee shop, juice bar, poolside bar, cocktail bar, disco bar and lounge. A shopping centre is located within the confines of the site, which includes a supermarket that stocks a wide range of produce and other essential items, as well as a bakers offering local pastries and breads for the perfect start to an exciting day.